This is a guest post by Brian Bellmont, president and founder of Bellmont Partners. Dance like nobody’s watching, the old saying goes. But what happens when hundreds of millions of people are glued to your every move? Since last February, nearly half a billion people around the world have experienced John Sweeney as he reprised his dance-happy character “Jiggly Boy” at a Minnesota Timberwolves game. More than 150 million people have watched the video the Timberwolves produced, and he’s racked up more than 300 million additional social, digital and traditional media impressions, showing up everywhere from People to Yahoo to The Huffington Post to the front page of Reddit. 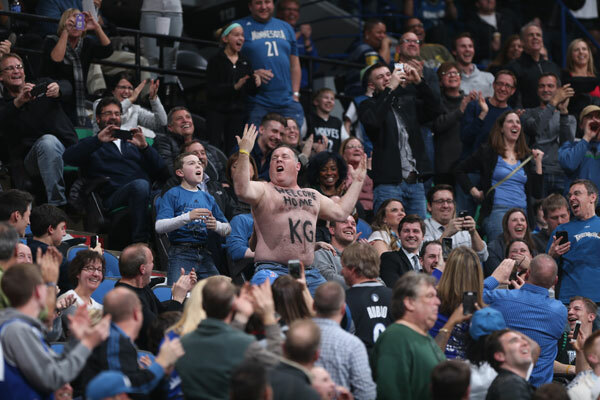 Yes, Jiggly Boy is a shirtless, enthusiastic NBA super-fan. But he’s also the living, breathing – and dancing – embodiment of the improv-based behaviors Sweeney – a corporate speaker, author, improv comedian and co-owner of the Brave New Workshop, the nation’s longest-running comedy theater – uses to help companies become more innovative. To welcome superstar Kevin Garnett back to the team, longtime Brave New Workshop client the Timberwolves asked Sweeney to reprise the popular character, affectionately dubbed “Jiggly Boy,” he’d created 12 years before. He had caused a stir in 2003 when the character got so excited during a game, he took off his shirt and danced, and was promptly ejected by “security guards,” who were actually also actors. The scene became as viral as it could at the time – it was a year before Facebook was invented – playing over and over on ESPN, and even catching the attention of Today Show anchors. Fast-forward to 2015 – call it Jiggly Boy 2: Electric Boogaloo. Although Sweeney expertly put his 20 years of improvisational comedy experience to work for the Timberwolves, Jiggly Boy wasn’t exactly a spontaneous outburst. Sweeney, his team at the Brave New Workshop and the Timberwolves concepted, planned and executed the performance, and our agency, Bellmont Partners, helped prepare for, shape and guide the ensuing media and public fervor. 1. Act fast. Bellmont Partners got the call about Jiggly Boy’s impending appearance just 24 hours before the game. We could have spent hours strategizing and planning, but instead we jumped in, echoing one of the behaviors Sweeney touts in his corporate training sessions. The prime goal, of course, was for Jiggly Boy to entertain and excite Timberwolves fans. And boy, did he. Because his dance was broadcast on the stadium’s Jumbotron, the crowd went absolutely wild. But we also wanted people to recognize that Jiggly Boy was a prime example of the improv-based behaviors Sweeney uses when training major companies like Microsoft and Facebook. We prepared short emails that media on-site could quickly skim, and developed content for the Workshop’s social media platforms to reinforce the messaging. We moved quickly, and it paid off. 2. Prepare for anything. The performance was well planned, but we knew it could play out in a million ways, so we made sure several photographers were positioned throughout the stadium to capture whatever happened. We prepped our media pitches before the game started, but we were ready to adapt, depending on how it shook out. The second Sweeney started his dance, we emailed Twin Cities sports reporters who were covering the game. Media started to identify Sweeney in their coverage and social media posts almost immediately. 3. Adapt as new opportunities arise. What we didn’t expect was that Sweeney’s enthusiastic performance would catch the attention of Garnett, who cracked up on the court and acknowledged Jiggly with a million-watt smile. That additional fuel allowed us to continue our full-court press with media through the summer, tying Sweeney’s improv performance back to his corporate-speaking career, and ensuring that a solid sliver of the spotlight shined back on him and his company.